Today is the Pi Day of our lives… 3/14/15 9:26:53. Nine digits of π! 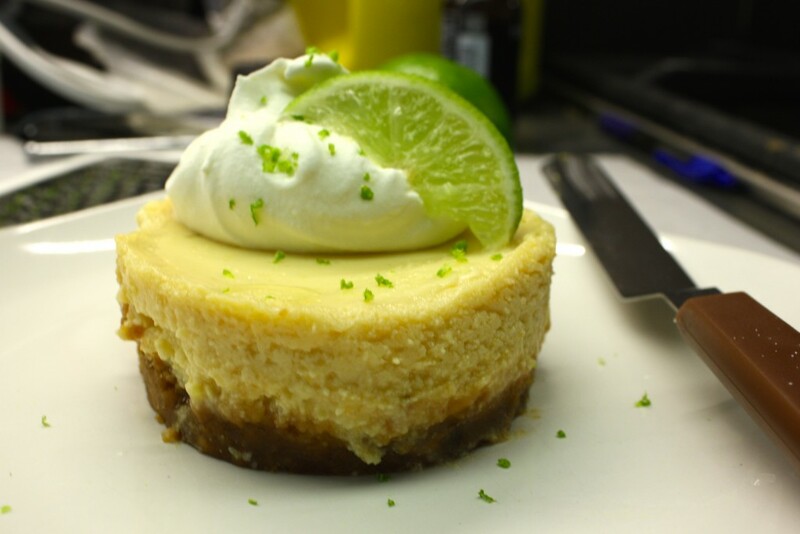 In honor of pi and all things circular, I’d like to introduce mini Key Lime Pies! The citrusy sweetness, and graham crackery crust goodness of this pie has made it one of my favorites, and the great thing is it’s surprisingly easy to bake yourself! Baking an entire pie is a dangerous thing when you’re not feeding a family. So, I decided to make miniature pies using ramekins, making it a perfect serving size for two! Not only does it automatically portion control, the ramekin mini pies use half the amount of crust required for a normal pie, bringing down the butter and sugar intake. Being a great fan of graham cracker crusts (and already having cut down the amount required), I opted to for the full fledged, non-light version—a beautiful combination of graham cracker crumbs, brown and white sugars, and a bit of melted butter. There’s a bit of carmelization as the crust bakes in the oven, giving it a nice crunch! Homemade crusts always taste so much better than the ready-to-go store bought versions; I’ve never looked back and I encourage everyone to give it a try! It’s easier and quicker than it may seem! I was inspired to play around with a lighter recipe and worked in fat-free greek yogurt into the mix, and recommend fat free condensed milk as well! You lose very little in flavor from the lowered fat content. Fresh limes are the way to go—bottled lime juice doesn’t have the same citrusy crispness of juice coming straight from the fruit. If real key limes are not an option, normal limes (which are what I’ve used here) work just as well! A dollop of fresh whipped cream (or a fat-free whipped topping, for a lighter version), a bit of grated zest, a slice of fresh lime, and this miniature dessert is ready to serve! Melt butter, 30 seconds in microwave. In a small bowl, combine brown and granulated sugar with melted butter. Add in graham crackers, mix until even and crumbs have been slightly moistened. Distribute crust mixture evenly among the four ramekins, ~3-4 tbs each. Level crumbs, then pack down with flat side of spoon or similar---I used the bottom of a scotch glass that fit perfectly in the ramekins. Place ramekins on a baking sheet and bake for 10 minutes until crust turns dark brown in color. Remove and allow to cool completely. In a medium-sized bowl, combine egg yolk, condensed milk, Greek yogurt, lime juice, and rind. Whisk together until well combined. This can also be done with an electric mixer (1-2 minutes), but I was too lazy to take that appliance out. Evenly divide the key lime filling among the ramekins with cooled crust, about 3/4 c each or up to ramekin fill line. Place ramekins on a baking sheet and bake for 15-18 minutes, until filling is set. Filling near the border should be set, middle may be a bit wobbly. Remove and allow to cool completely. Cover and chill for ~2 hours in refridgerator. 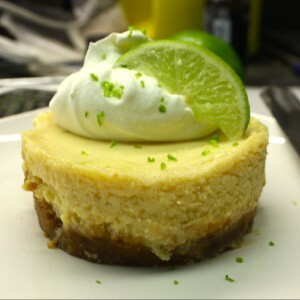 If making a regular-sized Key Lime Pie, please ensure to DOUBLE the graham cracker crust recipe. These delicious little treats can be enjoyed straight from the ramekin, or fancifully plated—I ran a small icing spatula around the edge of each pie to loosen and remove. Then, I plated them with a dollop of fresh whipped cream (whisk heavy cream + sugar + vanilla), a sprinkle of lime rind, and a small slice of fresh lime. A refreshing treat for any time of year! Thanks for stopping by and have a happy and pie-filled Pi Day!